You’ve gone to bars and church. You’ve tried meeting through mutual friends. You’ve even attempted online dating. But you just can’t seem to find the one. Though many of us have learned to look past the sappy romantic comedies and pop songs to view things realistically, it still doesn’t take away the yearning that many of us want someone to share a laugh with, do an activity together, or have an intimate connection. A lot of people have resorted to mobile dating. Its popularity is now picking up speed from men and women of any demographic in cities both big, small, and in-between and there is a multitude of dating apps for you to choose. For those who are looking for a possible romantic connection, here are a few tips on how to maximize your mobile dating app efficiency. Tinder is probably the most used and well-known dating app. You build a profile, and it shows you other people’s (you can select if you’re looking for men, women, or both). You can “swipe right” on their profile, meaning you like them, or “swipe left,” meaning you’re not interested, and can even “super like” someone – meaning you’re interested. If both of you have swiped right on each other, then it becomes a match, and you have the opportunity to exchange messages. A quick Google search will provide that there are plenty of people who found their soul mates: http://www.cosmopolitan.com/sexlove/news/a53737/i-met-my-husband-on-tinder. How to benefit the most: Put pictures up that exhibit your interests more than your body. One thing that attracts people to each other is the idea that the other person has hobbies and is active. If you have mutual interests, it’ll make it easier to meet up, if they are different it’ll give you a chance to teach each other something new. Some people will insert their unwelcome advances mid-conversation; others will save you the trouble and cold-open with them. The best way to go about this scenario is to un-match them immediately and not let it discourage you. This app is pretty similar to Tinder; you’re shown profiles and have to swipe left and right to signal your interest. There’s a message bubble in the top right corner to start a conversation in the next 24 hours if you match. Here’s the twist: only girls can start the discussion. The only thing a guy can do to keep the connection is to sustain the chat bubble for another 24 hours, in hopes of the girl contacting him. Unlike Tinder, you can rewind on a person you should have liked but accidentally didn’t – just press “ShakeBack.” Tinder has a rewind feature, too, but costs a monthly fee to use it. How to benefit the most: Remember: you only have 24 hours to start a conversation (48 if the guy extends the deadline), so try to start a discussion right away or at least within a few hours. Take a quick look at their profile details, as Bumble gives you several opportunities to write about your interests. Come up with something original; perhaps mention something fun you saw in one of their pictures. Women also have more power in this app. Every day at noon, men receive a selection of profiles that they matched with based on profile details and their linked Facebook account. Once the man decides who to “like,” the woman will then have the chance to connect with him and start a conversation. The chat window is open for seven days. This app takes it a step further by taking into consideration LGBTQ members, who receive the same amount of matches every day at noon. Several articles show that many people have also found their spouses and partners through this app. How to benefit the most: Select your preferences, such as ethnicity (you can even put that you don’t care). This app gives you options that some of the other ones don’t. You’re required to enter your school or workplace, religion, ethnicity, and write a few lines about yourself. There are many mobile dating apps are more niche and less accessible. “Hinge” is one – this app only connects you to people you have mutual Facebook friends. “Grindr” is directed specifically toward gay and bisexual men. “DragonFruit” is an app aimed specifically at matching people based on their technological interests, like mutual affinity for specific video games and anime. There are also apps geared toward religion-affiliation, such as “Christian Mingle,” “J-Swipe,” or “Minder,” as well as ethnicity-centric apps, like “Plenty of Fish” and “Amor.” These are only a few of plenty of dating apps designed to help you meet your match! Remember that life is what you make it. Living Full Out is all about channeling positive energy. Your perception of things impacts your experiences. Be smart and safe about your decisions but don’t let it discourage you from pursuing love. Set your mind to it. 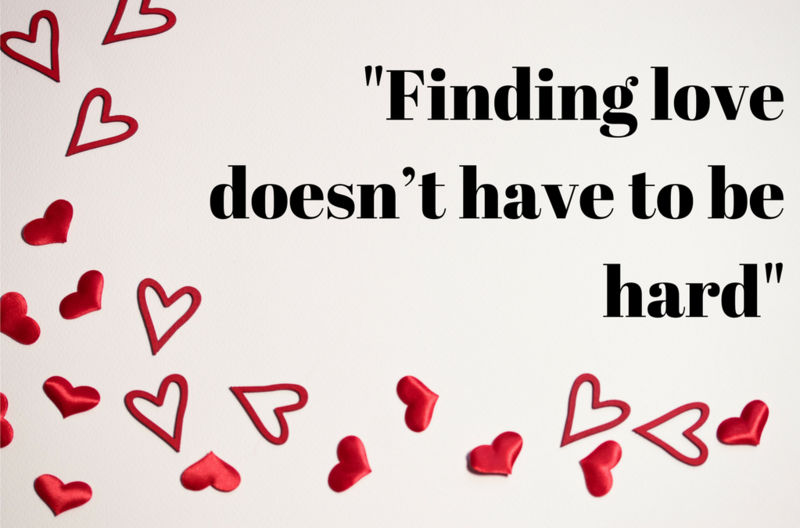 Finding love doesn’t have to be hard. Technology can either facilitate that or put a façade on it. The best thing to do is not put so much pressure on yourself and just focus on your passion. Go after your goals and try to have fun whenever you can. People are attracted to motivated, happy people. Maximize your potential to meet the one by Living Full Out!